We are very excited to announce that Lapel Stick is being featured in 2 page editorial article and product review in the April / May 2012 issue of Quilting Arts Magazine. 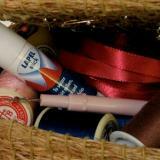 This amazing article talks about the many uses for Lapel Stick in quilting and sewing as a temporary non-toxic fabric adhesive. The feature was written by Maria Elkins (an award winning original art quilter and noted quilting author) in the Out Of The Toolbox section and appears on page 76 and 77. To read the entire article you can order a copy of Quilting Arts magazine online or you can find a copy at most local quilting stores in Canada and the USA. Our thanks to everyone at Quilting Arts and to Maria Elkins for choosing Lapel Stick as a feature product for Quilters, Sewers, and Crafters!